Spend any amount of time with a VOSH volunteer and you will hear stories of past missions and unforgettable moments. The gratitude of the people that we serve along with the opportunity to experience a different culture on such a personal level is what keeps us returning for multiple missions. After your first mission, you are a VOSH veteran! Click on the Join a Mission link to get started! Note to Optometrists: The Minnesota Board of Optometry allows seven continuing education credits for a VOSH mission. There are also $500 scholarships available for MN O.D.s participating in their first VOSH / MN mission. 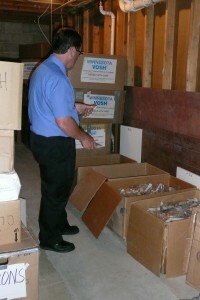 You can organize an eyeglasses collection project at your place of work, church or civic organization. Contact us at holeintheday@hotmail.com to request a collection box. When full, mail it to VOSH headquarters and a replacement box will be sent back to you. Anyone working in the eye care professions can collect patient’s donated eyeglasses, neutralize and bag them in your own office and send them to VOSH-Minnesota. See VOSH’s neutralizing instructions for labeling and bagging the glasses to make them most useful for VOSH. For those in the metro area, we gather regularly at the Crystal Vision Clinic to sort and pack eyeglasses for missions. If you are thinking about participating in a mission, would like to get a first hand look at what we do, or want to help but can’t manage an overseas mission, this is a great way to get involved. We meet on the first and third Tuesdays and Thursdays of the month from 6:00 to 8:00 pm at Crystal Vision Clinic, 5200 Douglas Drive, Crystal, MN 55429. Come for any or all of that time frame. Exception: No workshops until Jan. 17, 2017. We know there are optometrists who would like to volunteer for a mission but have significant school or practice debt and feel they can’t spare the resources to do it. We also know many ODs appreciate the spirit of what VOSH can accomplish and may be financially able to participate but have family or physical concerns that prevent them from doing so. Here is a new way to connect those who want to get involved with those who can help make it happen: make a donation that will specifically help sponsor a fellow OD on a mission. Contributions can be for any amount – $50, $200, $1000 or whatever you feel able to donate. Those funds will be set aside to help Minnesota ODs (up to $500 per person depending on availability) who feel they need financial assistance to participate in a mission. Simply include “Adopt a Doc” on the memo line of your check. VOSH/Minnesota is a 501 (c) (3) tax exempt non-profit organization. Donations help VOSH purchase equipment used on missions, supplies needed for packing and boxing the eyeglasses, purchasing eyeglasses for patients and sponsoring optometrists on missions. Donations of any amount are welcome. Contributions of at least $25 will provide you with a membership to VOSH/Minnesota and VOSH/International. Of that amount, we send $10 to VOSH/International.